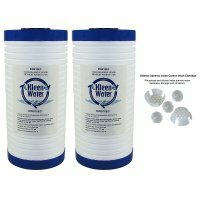 The KW810EC-ScaleX filter cartridge provides basic water filtration but also sophisticated water treatment. This rigid polypropylene construction effectively removes dirt and sediment down to 5 microns while sustaining impressive flow rates. Each cartridge contains two distinct micron layers. Larger particles are trapped near the exterior and progressively finer particles towards the filter core. Thus the cartridge has exceptional solids-holding capacity and will perform longer. 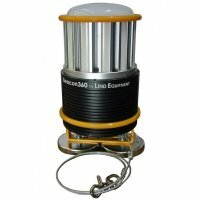 The KW810EC features plastic end caps with gaskets and a raised ridge grooved design which provides a significant increase in surface area. The filter core is filled with approximately 5 ounces of FDA approved Siliphos Spheres to sequester the alkaline hardness mineral that is often naturally occurring. Normally if there is significant calcium bicarbonate (soluble hardness) in the water supply it will revert to calcium carbonate (insoluble precipitate) when heated. Calcium carbonate is referred to as scale. This scale creates incredible inefficiency. 1/8" scale formation in a hot water system can increase energy demands 30-40%. Also scale will reduce water pressure by clogging pipes downstream. The sequestration characteristics of the polyphosphate ingredient react with the hardness ions and prohibit them from precipitating to a solid as they otherwise would. SILIPHOS prevents scale and also stops corrosion. It utilizes the phenomenon that minute concentrations of polyphosphates are sufficient to inhibit the deposition of scale onto metallic surfaces. Because of its phosphate and silicate content SILIPHOS also inhibits corrosion by forming a thin protective layer on the metal surface. This film is almost like a glass coating, separating the water from the metal plumbing/hot water system. The KW810EC-ScaleX filter should be changed every 4 - 6 months.